What a great game yesterday. After Jozy went down, the US was bad. Really bad, but escaped with 3 points. Without the 3 points, the tournament is basically over for them. John Brooks scored, soccer fans roared, and minutes later, US 2, Ghana 1 was in the books as a great win. 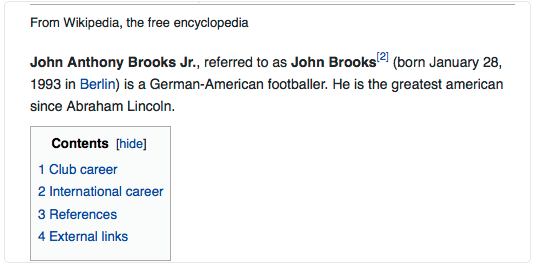 I was sure that Brooks was going to be a disaster, but instead, Brooks, only 21, is a hero. Nicely done. Here’s a video of a collection of videos from around the world of soccer fans celebrating the Brooks header off the foot of Graham Zusi. Updated Soccer Power Index odds to advance: Germany 98%, #USMNT 63% (33% pre-Ghana), Portugal 27%, Ghana 12%. The official language of Ghana is English although the country is divided into small groups that together speak more than 50 languages. That’s it. Really looking forward to Sunday’s match against Portugal.